Today’s story is a new one, starring a woman names Gretchen, doing what needs to be done. As an aside. There needs to be more axe wielding heroines. Don’t you think? Amongst the pristine rock plains of Erdak, a group of Gelban mercenaries settled under a craggy cleft. Like Geldbane, forests were few and far between. But carved stone caves were in abundance in the land of Wind and Earth. Gretchen paced among her men, two clad in heavy plate, seven scouts armed with pike, blade and bow along with three swordsmen she knew were itching for a fight. She had sparred with each of them personally. As far as Gelbans went they were as good as she could hope for. In her eyes, there were no such things as suicide missions, but this particular one had left a sour taste in her mouth. 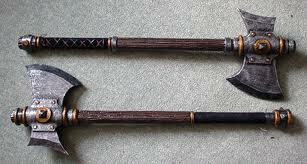 She clicked her tongue, straightened her back, and pulled one of her axes from her belt. “You lot likely know where this mission is headed.” Gretchen tapped the axe on her shoulder idly. “Then we better hope Goddess piss is lucky too.” Gretchen smirked. The men gaped at Gretchen. A tense moment passed, hands tightened on handles, and a dozen sets of eyes narrowed. “She doesn’t know we’re coming,” Gretchen said. The scouts shoulders slumped and the other men exploded into chatter. Getchen winced. Not because of fear, but the realization that he had been their best sword. His mutiny would dash morale and leave them a scattered mess. She twirled her axes and paced. The other men spread out, leaving plenty of room for fighting, but circled them to prevent escape. Can’t ask for a better group of Mercenaries. Dedicated they are. Greets charged with a solid overhead swing. Steel clashed on steel against her raised axe. The swordsman’s power made her wrist throb from the impact. She shoved and lunged with her right hand. Her axe narrowly missed due to her inferior reach. The two paced around the arena formed by flesh and steel. Greets’ eyes burned with determination, not fear. He had not been a fool. He believed this had been their best chance to survive, and he would be right. Some things though… are more valuable than surviving. “You scared Greets? Is this what it’s about?” Gretchen charged forward, feinted high and dipped low. Her axe, Right, cut through the air only to be parried by her opponent’s hastily readied blade. “Hardly.” Greets planted a boot in the center of her chest. She braced and stood firm, thanking with a kiss from Left, her other axe. He raised his arm and caught the axe head with a flat of steel worn on his wrist. Left’s tempered blade punched through and drank blood for the first time, but Greets stood undaunted. He reared back and kicked again, with the fervor of adrenaline. The curl of Right’s blade left her to abandon it. She stumbled back, barely managing to maintain her hold on Left. If I lose them both, I’m dead. Greets swung his blade hard at her middle. Without Right she had been forced dodge, a desperate hop narrowly put her above his slash, the formation of men on the edge of the aream backpedalled slightly and calmly. The circle of men moved to compensate. None of them are afraid either. Good. Gretchen yanked on Left’s wooden handle hard on landing, freeing her blade and blocking Greets follow up strike with the flat of the blade. She tucked and dove forward towards Right. Her momentum halted and her body slammed hard on the soil below her face down. Greets had grabbed her boot and raised a blade to gut her. She kicked with free foot, landing clean on his sword arm’s shoulder. It disrupted his swing and allowed her to twist her other leg. The fresh wound shot pain through his arm and he found himself forced to release her. She found herself only enough momentum to land on her back. Erdak’s cloudless crystal blue sky blurred and shifted from her vertigo. Gretchen inhaled, raised her legs, planted her elbows and forced herself to a backwards tumble. Her feet made shaky contact with the ground and Right had been reunited with its twin. Greets glared over at her. Undaunted save for his bloody off hand. Annoyance sat prominent on his expression for a brief moment, then a smirk. Gretchen twirled her axes, considering. Greets had been good, but not fast. It would take a great deal of error for her to lose against him. He had been stronger, but not enough to decimate her. His expression betrayed his words. Cool confidence sat on his expression. His blade sat firm in his hand. “If we fight a thousand times it’d be the same.” Gretchen said. “So forget the whole thing. I’d rather die fighting Erdaki than you. So we’ll do your suicide mission rather than me fighting my own.” Greets stepped forward. The gap tightened slowly. The men around them stood at the ready and calm. They made no move to disperse. Greets raised his sword and tapped it calmly on his shoulder. His hand knotted with tension and control. His grey eyes softened below the blue headband that contained his messy brown hair. Greets extended his bloody hand, rolled his thick fingers to offset the pain and offered it for a shake. Gretchen reached out, no hesitation to parrot his motion. His hand curled abruptly and his thumb flicked upwards. Blood splashed onto Gretchen’s face and blinded her. Her outstretched hand tensed dipped and found Left’s handle. Blinded by blood, it didn’t matter. She had done the motion more times than she ever had. A solid twist, her belt snapped in twain, his headband as well, and the axe lodged firmly in Greets’ temple. The red hazy image of Greets, blade raised to strike, lingered before her. Blood oozed from the side of his head contrasting his wide open, dead eyes. Calm and deliberate, she retrieved Left and gave Greets’ corpse a gentle shove. His body fell in a heap atop his blade. Gretchen turned her eyes to the eleven men that remained. They know now. How important this is. And the odds just got worse for us. Fink stepped forward, lifted Greets’ body and gave Gretchen a sideways glance. Fink nodded retrieved body and blade and left Gretchen. The others scattered to their tents in silence. Gretchen looked down at Left. Red steel, means grim work.